Kiran Ranga's job has nothing to do with coffee. Yet he sniffs coffee beans every 15 minutes at work. It is his diversion, a break from his real job, that of smelling a "palette" - as he puts it - of 800 odd aromatic substances he keeps acquiring and testing. Ranga is Founder and Managing Director of Ripple Fragrances, the fragrance subsidiary of the Mysore-based NR Group, making room fresheners and car fresheners under the 'Lia' brand, and scented candles, fragrance vaporizers and similar products under the 'Iris' brand. To get the best fragrances he sniffs and experiments. Ranga, who holds a Bachelor's degree in Business and Perfumery from the UK's University of Plymouth, loves it. He has even set up a laboratory at home where he does most of his olfactory testing - and that too before break-fast, because a full stomach dulls the olfactory nerves. Ranga, who is called a Master Fragrance Creator, has developed many hybrid fragrances himself - apple cinnamon, jasmine neroli, orange blossom and so forth - by blending and mixing over 60 different scented oils in different ratios. "My grandfather started making and selling agarbattis (incense sticks) in the 1940s," he says. "In those days buyers had little choice of fragrances. But times have changed." Ranga buys his raw material from globally renowned fragrance houses such as International Flavours and Fragrances (IFF), Givaudan and Symrise. Among his buyers is the Paris-based Christian Dior. So how is it done? Ranga gets all technical. "The basic ingredients have various classifications such as Chypre, Fougere and Oriental," he says. "Chypre is a family of perfumes with a citrus top note, Fougere has a top note of lavender, while Oriental is known for its sweet and heavy notes of vanilla, musks and amber." These are mixed and matched, dilutants - usually alcohol - and antioxidants added for the final perfume. But it is not only perfumes and perfumed products which give off fragrances. So do many packaged foods, and companies making these take an enormous amount of pain getting the fragrance right, since, according to experts, around 75 to 80 per cent of an edible item's taste actually comes from the smell it gives off. Grasse in Southern France is the birthplace of modern perfumery. Initially, perfumes were used by women only to reduce the odour of their leather gloves. "When you eat a mint based Lay's potato chip, for instance, the first note that hits you comes from the mint, followed by the spices as you chew," says T.S.R. Murali, Executive Director, Technology, at PepsiCo, India Region, who heads the company's vast research and development (R&D) wing. "The aftertaste too is a residue of mint." The latest product in which Murali's team played a key role was the '7UP Masala Nimbu Soda', a drink PepsiCo introduced in Punjab this summer. "In the South, to which I belong, we are not used to masala in lime juice, but in North India it is omnipresent," he says. With spices, aroma is all, but they present a major challenge. "They are one of the most contaminated things in the world, and extracting pure samples and using them in beverages which need to have a shelf life of months takes some doing," Murali adds. 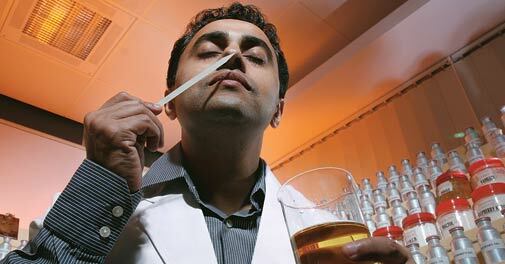 Entry salaries for sniffers are around Rs 4 lakh per year, which rise to about Rs 15 lakh after a decade's experience. It is a demanding task. "Those doing the job must have good noses to start with, but they should also be non-smokers, and should not have eaten, or inhaled any strong odour, for at least an hour before starting work," says Prabhakar Kanade, Chief R&D Officer of Mother Dairy, who heads a team of 32. Health matters too. "If someone has a cold, he will not be included in the evaluators' panel," says C.S. Sai, General Manager, Foods R&D at CavinKare, Chennai. Every year Mother Dairy comes out with new flavours for its ice creams and other products. "They are a combination of natural fruits, natural flavours and formulated flavours," he adds. "For each new aroma we introduce, we usually have a panel of eight evaluators who sit in an air-conditioned room and are given the same product to pass judgement on." At other firms, panels can be larger. 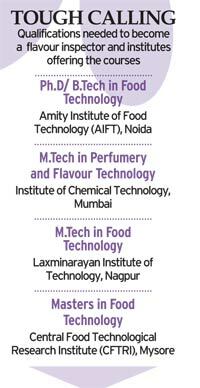 "The fragrance market in India is growing, but the growth varies across product categories," says T.T.P. Shaheel, Business Unit Head India (Fragrances) at IFF India, which supplies raw material to many companies including Ripple Fragrances. "Newer categories, such as deodorants, hair conditioners and face wash have a lot of growth potential, but others like bar soaps and detergents, which are heavily penetrated already, are not growing so quickly." But there are also curious, Indiaspecific impediments. The deodorant market, for instance, has to cope with a paucity of volunteers for testing. "It is hard to get volunteers, especially women, willing to let evaluators sniff their underarms. It is still a sort of taboo here," says Meenakshi Narayanan, General Manager, Product development, CavinKare. In the West, many evaluators have their noses insured as part of company provided health insurance. "It would be good if Indian companies too followed that," says Sai. "There is after all a risk in smelling new products."